Beth and I are headed to Austin the weekend after next - 2/14 through 2/17. We'll be getting in just before noon on Saturday and leaving at about 5 on Tuesday, so we've got room for quite a few meals. We will, of course, have a rental car and a GPS and I'm very willing to drive for good food or good experiences. We have no itinerary planned besides food, so I'd appreciate anything in that vein, too. An example of non-food activities we particularly enjoyed in Las Vegas: the liberace museum, the atomic energy museum, and the red rock area. So anyway, here's our rough sketch.. anyone who can help fill in the details can be my BFF. Saturday dinner - valentines day. We don't want to go to any place that will be packed with romancing couples or doing special valentines day menus. Beth wants one tex-mex meal while we're down there, but I haven't the faintest clue where to start there. I think I could slip northern mexican or new mexican past her and she'd be happy. Another option is salt lick, which she's a fan of. Sunday lunch - no idea. Maybe some more of the lockhart/luling places that we missed on saturday. Sunday dinner - Salt Lick or tex-mex/northern-mex/new-mex, whichever we didn't do on Saturday. Monday lunch - I was thinking Monday we might drive to Enchanted Rock via Fredericksburg in the morning, hike up to the summit and back down, and then head to Coopers in Llano, and then back to Austin. Is it going to be absolutely packed on Presidents Day? 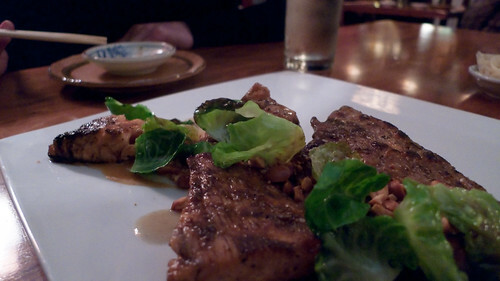 Monday Dinner - Only meal actually planned - 8:30pm reservation at Uchi. One of those "we can justify the price when it comes out of the travel budget, instead of the normal budget" type places, and it seems to get consistently great reviews. Anyone been? Tuesday Lunch - No clue. Open to suggestions. Any non-food ideas? Any worthwhile bakeries, ice cream shops, specialty grocery stores, and so on? Well, certainly everything I have to say about bbq is in those threads (and a video). I think my first choice of all would be Mueller's in Taylor, though it took till the second visit for that to be true. Otherwise it would be Smitty's (the old market) in Lockhart, straight from the airport. Amy's ice cream shops are all over, they're good. Hut's has turned up on my agenda every time, for burger and beer. Tex-Mex? I've been to several places, all good enough, none life-changing. As far as tourist stuff goes, most of mine has been kid-oriented, Fredericksburg is cute and enjoyable in a Door County-y way; the capitol and the adjacent history museum are well worth a tour. The bats are awesome, if it's their busy season. Nice weekend, actually very nice weekend. Cooper's in Llano, where god goes when she is in the mood for Texas style Brisket, is my number one recommendation, which you have on your list. 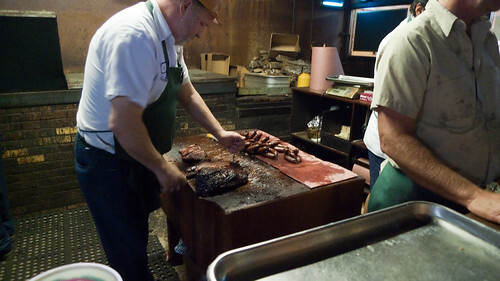 Salt Lick in Driftwood is a good choice, Ellen's favorite coleslaw, Black's, which you don't mention, is my Austin/Hill Country non Cooper's in Llano pick, and I am a fan of Kreuz more so than Smitty's, though Smitty's win's hands down on BBQ atmosphere. Louie Mueller's brisket disappointed, which is not to say it won't be terrific when you visit, took Mike two tries as he mentioned. Southside Market in Elgin might be worth a visit for mutton and Meyer's, also in Elgin, has terrific "Hot Guts" as they refer to the sausage in the area. I've not been to City Market in Luling, which I consider an oversight to be corrected soon as possible. 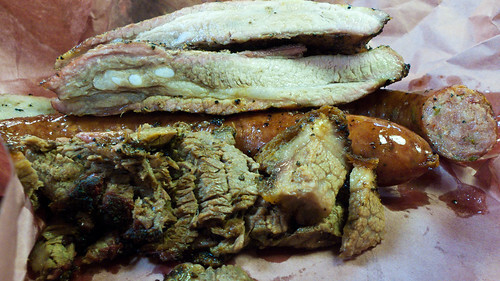 If you are feeling frisky you might want to try Snow's BBQ in Lexington, 51-miles East of Austin. 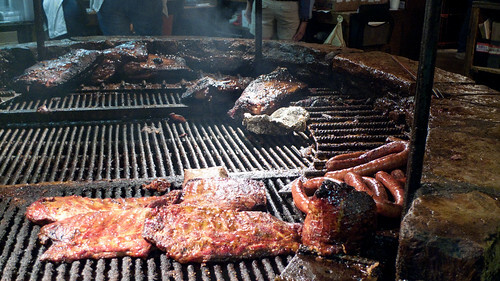 Texas Monthly crowned Snow's Best BBQ in Texas. Snow's is only open 8am - Noonish on Saturdays, with all the publicity I'd guess they run out of BBQ earlier these days. Unfortunately for us, our flight gets in at noon on Saturday, and we'll be gone by Tuesday -- no Snow's. I meant to include Black's, don't know how I forgot it. Anyone have any insight on City Meat Market in Giddings, or any of the other Giddings joints? Mann's in Austin proper got well received by Texas Monthly, but it seems to be nearly completely unreviewed by other serious barbecue folks, so I'm curious but wary. Austinite friends keep saying "Rudy's", but I get the feeling it's more flash and kitsch than anything else.. am I right? Are they? 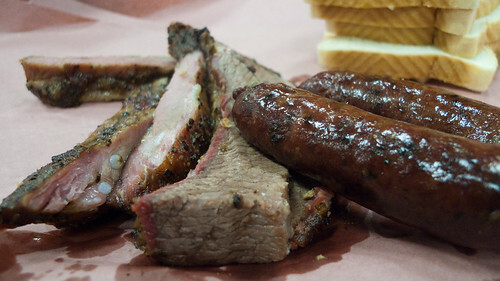 Not only are the bbq joints outside of Austin generally considered better, they invariably have a small-town atmosphere that adds hugely to the experience. Austin has its own considerable atmosphere, of course, but enjoy it with some other drink-oriented meal like Tex-Mex or a Hut burger, I say. 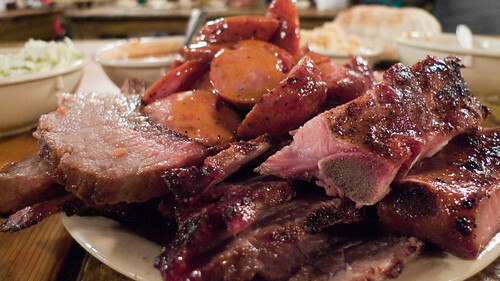 For me, the real choice is-- eating with someone who expects sides and other niceties: Black's, Salt Lick. Eating with someone who has no problem with an all-meat meal served on paper: the others. That's what I thought, thanks for confirming! If I give Beth a meal at salt lick (which is no hardship!) I think I can get away with at least a half dozen meat-on-a-piece-of-paper meals (which she doesn't mind when it's a combo from honey one or uncle john's). 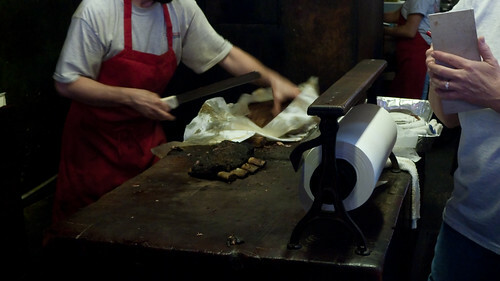 Black's brisket was like the most succulent piece of oak you could ever eat. No insult there at all -- it's the epitome of wood flavor in your food. Salt Lick's brisket was good, but not earth shattering (I like Smoque's better), but their sausage makes it worth the trip. Make sure you go out to the original in Dripping Springs. It's a weird little drive: A highway peters out to a backroad, a few twists and turns, and when you see the crowd, you know you're there. All the frat boys and gals at UT get their tex-mex on at Chuy's. iblock9 wrote: All the frat boys and gals at UT get their tex-mex on at Chuy's. When I was last in Austin, November 08 and forced to make the annual Chuy's run, I tried very hard to take Chuy's on it's own level. To appreciate it as some type of institution or something. Nope. The food is tolerable in the sense that you won't barf, but the pleasure from it, at least for me is nil. 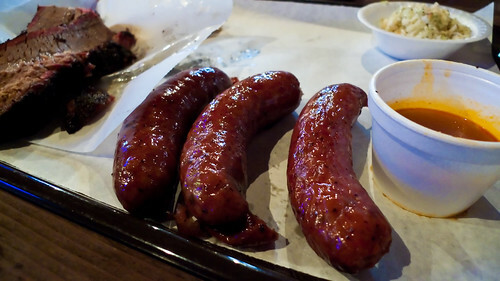 Because I'm rather stuck in NW Austin for a week, I cannot much get to the "real" BBQ places. Mann's, which I discovered last trip based on the Texas Monthly article, served as a very, very good replacement. If nothing else, the Mann's themselves are great hosts, and when ordering brisket, you get the classic line from Jim Mann, "lean or with flavor." I very much agree with MikeG that the whole small town package adds to the experience. The drive to Cooper's is much more scenic, for what it's worth than the drive to Lockhart. For me, the best thing (by far) at Salt Lick is the pie. I'm pretty much always happy at Hoovers for tons of Southern style food. Save room for dessert. I also agree with Mike about Amy's Ice Cream. Well worth a stop. Not last year, but the year before, I had dinner at Lambert's in downtown Austin. It bills itself as "Fancy BBQ", which sounds completely oxymoronic right? The food, however, was exceedingly good. Kinda like a place Rob Levitt would operate if he operated in Austin. Austin seems to have a thriving Vietnamese restaurant community, but I cannot speak to a one because I hang with a crew who fears such food when I'm in Austin. Hey, isn't that the place where the Bush Twins got busted for underage drinking back in the day? Maudie's is great tex-mex w/ multiple locations in Austin, kind of a dive at some locations but good. Also Polvo's is a good local favorite in south austin. Trudy's is another good one, the best atmosphere probably being at the central/campus location, but probably the most crowded too. Also Z-tejas on 6th has great margaritas. 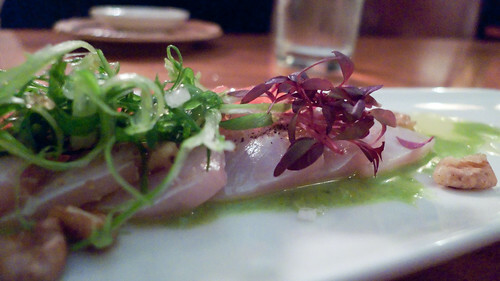 Uchi is great, definently the triendiest sushi place in Austin. Always really crowded, so it's good to have reservation. The Shag roll is my favorite. Other good eats Vespaio on South Congress, or Enoteca next door is also owned by them, less expensive and a better lunch option. Favorite pizza places: The parlor or Homeslice. Unique to Austin, Alamo Drafthouse (don't know if people like to see movies on vacation though). A trip to barton springs pool might be worth it, while a little chilly. Hike up the greenbelt from the pool on some good trails. Blanton Art Musuem is new too, pretty good musuem on campus. samad3, welcome to LTH and thanks for the advice! An austinite friend recommended Alamo Drafthouse, and DJ Spooky is presenting his movie Rebirth of a Nation there on the Sunday we're in town, so that might be our route if we get shut out of enchanted rock. Sounds like a nice trip you’ve got lined up, Ed. Good idea to hit the ground running and knock off the Lockhart/Luling ‘cue right out the gates. Getting that “out of the way” will let you explore other stuff around town, though it’s understandable if you end up driving back out there everyday of your trip too. For something Mex, you may want to consider the previously mentioned Curra’s Grill for “interior Mexican” though I can understand if this is not a high priority given the abundance of regional Mexican you already have at your disposal. Having said that, along similar lines in the “interior Mexican” vein, there’s also Azul Tequila, Sazon and, for something a bit more upscale, Fonda San Miguel (particularly for their brunch buffet). I’m not much of a fan of gloopy-queso & fajita Tex-Mex, but the aforementioned Polvo’s and Chuy’s will fit that bill. Also consider Habanero Mexican Café, and be sure not to miss their outstanding beef fajitas rancheras. My preference is more for Tejano-style Tex-Mex, which I chase down at a select handful of roadside carts about town. For Southwestern / (slightly) New Mexican, there is The Roaring Fork which is also a good option for a couple of snacks (green chile pork stew) and cocktails at the bar. I pretty much always recommend Asia Café for Sichuanese that I think compares very favorably to other storied Sichuan restaurants around the country, including those of your fine town as well. Also in the same plaza is a relatively new place, Chen’s Noodle House offering what I believe are Austin’s only hand-shaved noodles. They’re no Katy’s, and it’s a very limited menu, but excellent all the same. While I have not been there, and while there are mixed reviews, dicksond reported favorably on Sambet’s which is also in the same plaza if you wanted to do an intra-plaza crawl. I won’t say much about barbecue since it’s all been said before, but I agree with your friend’s about Rudy’s, and I agree with Vital Information about Lambert’s, though I wouldn’t typically recommend Lambert’s to an out-of-town visitor if they already had professional barbecue on the agenda. Go get yourself a burger and a beer at Casino el Camino – ask for your preferred cooking specs, specify fresh hand-cut fries, graba couple of beers, and put on your patience hat because the 30+minute wait will be worth it. I hear the hot dog is a thing of beauty, too. And don’t listen to that Mike G about Hut’s ! For something a little fancy (maybe just this side of fancy, but nice), check out Backstage Steakhouse which, despite its name, is really quite strong on the fish and seafood, though everything is top notch, and leagues beyond the other sterile upscale spots downtown. Beautiful outdoor setting, too. Be sure to call ahead and ask if Chef Tatum is in the kitchen because it’s his chops that make the meal. I also find myself whiling away hours at the bar at Parkside on weeknights, particularly Wednesdays when their diverse selection of oysters are half-price (not that you’ll be there on a Weds). Everything off the raw bar menu is good, as is just about everything I’ve had there. 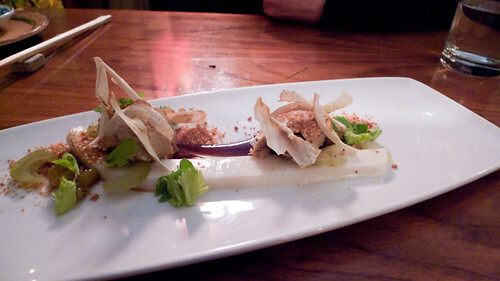 And in a similar vein, tucked away in a relatively quiet corner of downtown is a tiny little winebar called Mulberry, which has an interesting wine selection that always seems to be right up my alley, and the food has never missed a beat on my several visits. I would expect nothing less from Vital Information who picked up on something that even we here in Austin haven’t been able to fully describe yet, and that is the thriving Vietnamese community. There are several well-documented places which I can tell you about, but many, many more that are totally off the radar as I know it, and I suspect there are gems waiting to be found. Investigations ongoing. I’ve gotta run for now, but will try to offer a few more ideas when I have some time. PS. Alamo Drafthouse = good idea. Get some snacks (fried pickle spears) and take advantage of the great beer selection featuring some nice locals. Funny thing, this thread coming up. This morning, as I donned my fresh new t-shirt, I looked at it, and said to Debbie, the Other Dr. Gale, "If there was one diner in the whole world that I would/could have at the end of my block, it would be THIS one" with a gesture to my shirt. Las Manitas/Avenue Cafe, 211 Congress Avenue. Good solid Tex-Mex and Gringo from breakfast throughout the day. Extremely well-run house, very very Austin. I'd go back there in a heartbeat. Unfortunately, there's bad news about Las Manitas. MikeG, you can not imagine how that sickens my heart... One of my truly golden places. For another goddam useless Marriott. Yet another proof for the non-existence of God, which I will use in my intro philosophy classes. tatterdemalion wrote: I won’t say much about barbecue since it’s all been said before, but I agree with your friend’s about Rudy’s, and I agree with Vital Information about Lambert’s, though I wouldn’t typically recommend Lambert’s to an out-of-town visitor if they already had professional barbecue on the agenda. First of all, for the nice words. Now, Lamberts, I guess I should have been more clear. I would not recommend this place as a replacement for a trip to Llano or Lockhart or Taylor or whatnot, nor even a replacement for say Mann's. 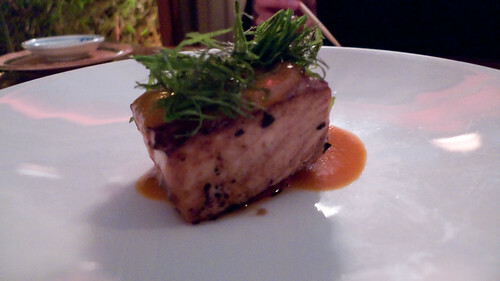 More, it would fit into the catagory of a fancy or upscale in-Austin meal. I think we are both saying, take Lambert's for what it is, an excellent restaurant, with good techniques, good ingredients not a BBQ classic. stevez wrote: Hey, isn't that the place where the Bush Twins got busted for underage drinking back in the day? You are correct. I will never understand Tex-Mex. Everything I have ever had at Chuy's was drenched in cheese (actually putting it in writing makes it seem ok). The Elvis Presley Memorial Combo and the Queso are edible. For whatever reason people love this place. Austin is a great walking town. I really enjoyed walking along the river watching all the turtles, snakes, and weird people. Walking around UT was also interesting and I am sure there are a couple of museums there that we missed. I would recommend the LBJ presidential library, the best that I have been to. Also, out in Johnson City is the LBJ Ranch which is now fully accessible to the public since the death of Lady Bird. 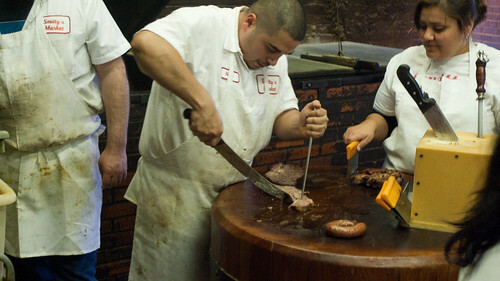 Personally, as for BBQ, Luling and Lockhard can't be beat. Also, the southside market in Elgin (with a hard G), has great sausage. Coopers in Llanos was a major disappointment of my trip. Nothing tastes good overcooked and dried out. Coming from the cardiac kid here, we had a "no more than on BBQ meal per day" rule. After a couple of meals of meat only - which is what you generally get in BBQ joints - we would head off to Luby's for a 3-5 vegetable meal to provide some balance. The Texas Chili Parlor was one of the most fun meals. The chili was pretty good. The servers were very friendly and sassy as could be. Lucky for you, we started in Austin and hit several joints! Bottom line, prior to this trip I was suspicious of anyone who tried to tell me Texas brisket beat smoked pork, but I now see the light. What those boys do to beef down there is sumthin' magical. And the best place in the entire world for smoked brisket is Smitty's in Lockhart TX. I know there are those who like Kruez but Smitty's is the original and I've never tasted anything better. The coolest thing about Smitty's is you walk into the smoke room from the street. When you walk in, there is an open fire on the floor! I don't care what else you do, you must go to Smitty's. We also hit Rudy Mikeskas is Taylor and Louie Miller's in Taylor. 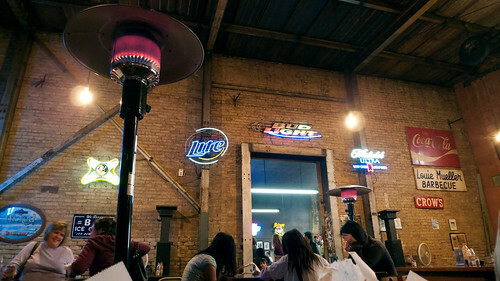 I was underwhelmed by Rudy's but would recommend Louie's, which had a deep powerful smoke to it. Finally, one that we really enjoyed but don't hear much about is Green Mesquite. Really liked this place and suggest you tray it. Also, in downtown Austin there is a terrific arts theater, where we saw Bonnie and Clyde. Great place to go after dinner! Unfortunately the weather before and after our trip seems to be much better than what we had while we were there, but it was still lovely. I'd like to get back again in late spring/early fall and see the region in full bloom. Hey Ed - heading down to Austin for a long weekend with the Bride, Friday through Sunday, and I may well borrow a whole lot of your itinerary. Not all of it, as we are attending a wedding, but will report back. dicksond wrote: Hey Ed - heading down to Austin for a long weekend with the Bride, Friday through Sunday, and I may well borrow a whole lot of your itinerary. Not all of it, as we are attending a wedding, but will report back. Hey, that's just the impetus I need to post pics + thoughts. Time to stop slacking. Look for a post or two tonight. 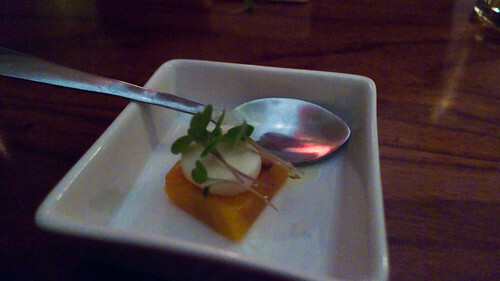 amuse: beet, creme fraiche, microgreens - simple, tasty, but not mindblowing. 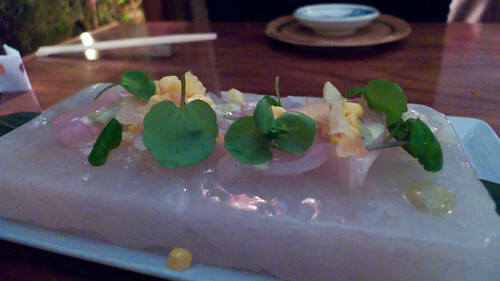 hiramasa salt rock: amberjack, serrano peppers, watercress, barley, corn - this was really delicious, well balanced, and beautifully fresh fish. 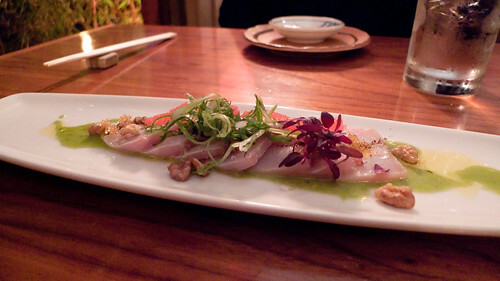 kan buri: japanese winter yellowtail, tarragon vinaigrette, walnuts, ruby red grapefruit, olive oil - also very good, although the star was the grapefruit. 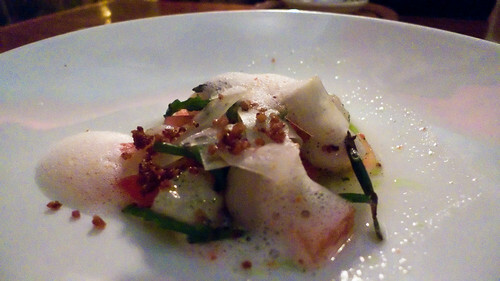 hotate suika: nantucket bay scallops, sea beans, compressed watermelon, sea salt, gribenes - one of my favorites of the night: salty, sweet, meaty, a little crunchy. 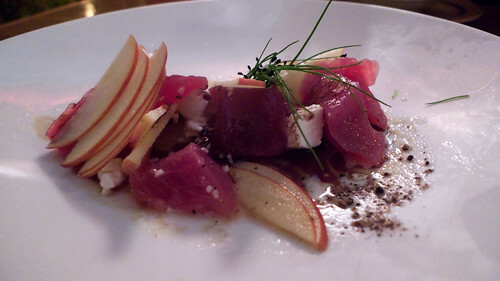 maguro sashimi, goat cheese: cracked pepper, fuji apple, pumpkin seed oil - the highlight here was the goat cheese. we both felt that the tuna was kind of lost when the parts were combined. 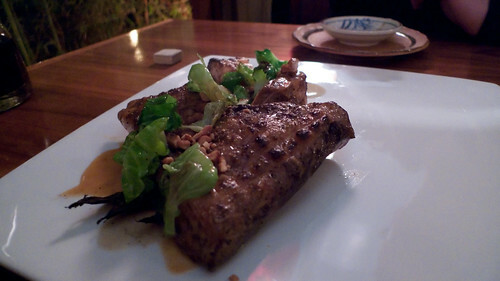 sake kama: salmon collar, ginger, garlic, brown butter, brussels sprouts - my absolute favorite. 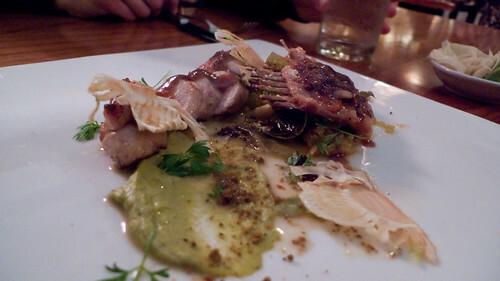 awesome salmon collar, perfectly cooked, with great sides and sauces. we spent 15 minutes cleaning every last bit of flesh off the bones. 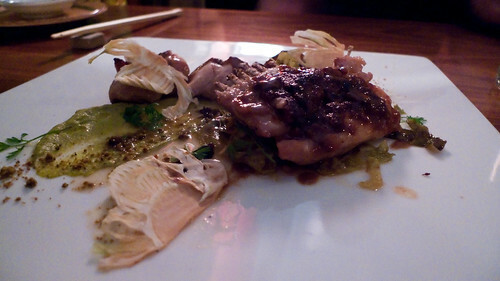 usagi yaki: grilled rabbit, sicilian pistachio, fennel, black mustard, celery root chips - perfectly cooked rabbit with a deliciously sweet crust. 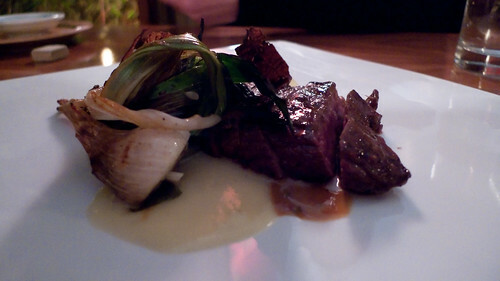 the black mustard sauce was really powerful, and the dish probably had a little bit too much going on. remove one component and it might be a bit better. 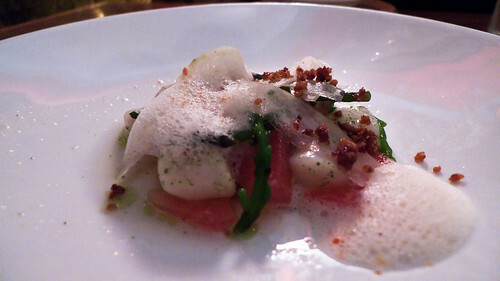 escolar: roasted tomatoes, tamarind, verjus, shiso - the low point of the night. 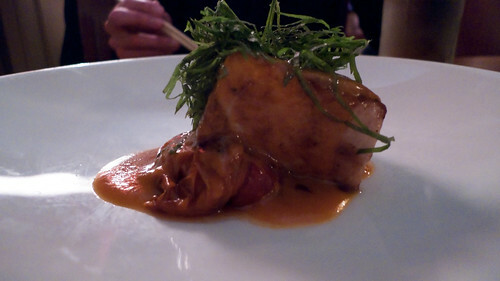 a big hunk of escolar in a tomato sauce, without much tamarind flavor. 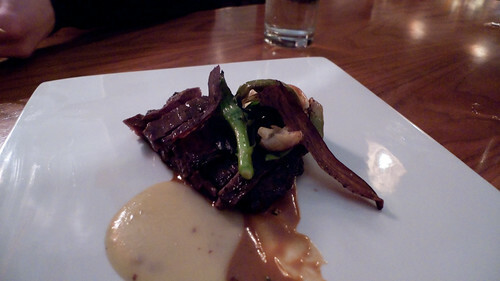 This wasn't on the printed omakase menu given to servers, and I think they ran out of what we were supposed to get. I wish we'd gotten what was on the original menu. 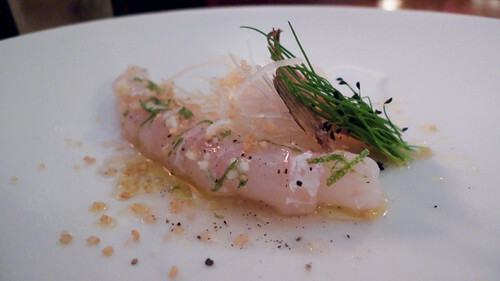 hirame usuzukuri: thinly sliced flounder, smoked sea salt, yuzu zest, daikon, quinoa candy - another solid dish, this one really celebrated the flounder more than some of the other raw fish dishes. gyu yaki: american wagyu skirt steak, satsumaimo, nasu, bone marrow miso - the wagyu skirt wasn't as good as the one at craftsteak, but it was still a delicious hunk of meat with that wonderful rich bone marrow miso sauce. 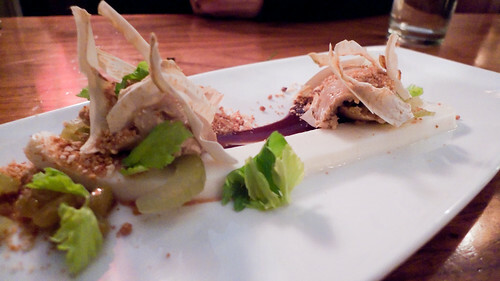 foie nuta: foie gras mousse, celery, peanuts, soy pudding, pickled raisins - also very, very rich, and one of the better dessert foie preps I've had. I wish the portion had been a little smaller, though. 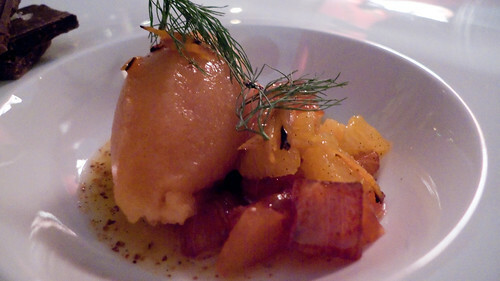 okashi: persimmon sorbet, espelette chocolate, orange - a night, refreshing end to the meal. 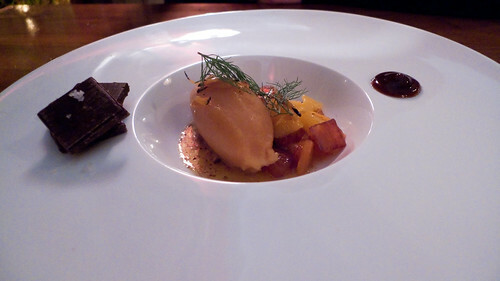 bitter chocolate and a coffee reduction were great with the sweet-sour persimmon sorbet. The whole thing came to ~200 for two, and I think this might have actually been more than if we'd ordered every dish off the menu, although the portions may have also been larger. If we go again (and I'd love to if I was in Austin again), we'd probably prefer to sit at the bar and just order the specials that appeal. This was a great meal and a great experience, though, and even the low points were tasty enough. Our last meal of this size/at this level a visit to Schwa last summer. Beth preferred Schwa, but I preferred Uchi. So, check it out, but I'd recommend ordering off the specials menu. Best single piece of meat/best brisket: Brisket at Cooper's in Llano. I know a lot of people have had consistency problems, but Beth and I both agreed that the brisket here was considerably better than anywhere else we went. Smoky, tender, beefy, rich and fatty. It made us feel like I could spend 30 years smoking a brisket every weekend and still not come close. It also, more than any other bit of barbecue we had, made us want to get a smoker. 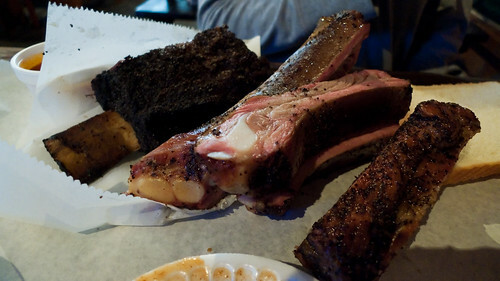 Second best piece of meat/best ribs: the beef rib at Louie Mueller in Taylor. Very good, with all of the same attributes as Cooper's brisket but just not quite as awesome. 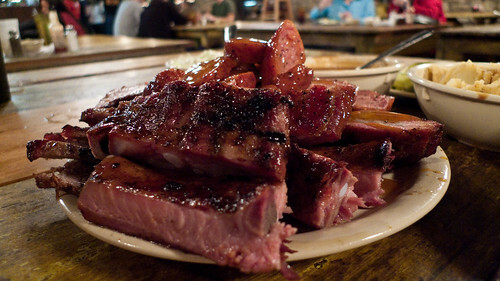 Best pork ribs: Salt Lick. I've grown up on aquarium ribs, so I think I'm always going to prefer a rib smoked over direct heat over the competition. 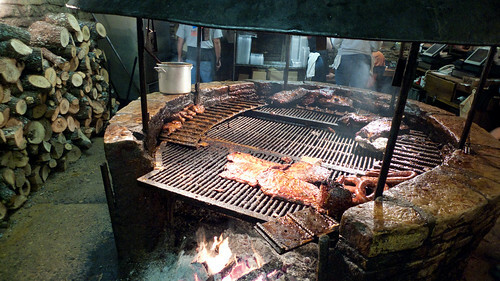 Salt Lick is one of the only places we went that turned out a pork rib I'd want to eat again. Best sausage: Louie Mueller in Taylor. Three varieties: chipotle, jalapeno, and plain. The plain was just fine, but the chipotle and jalapeno were outstanding. Best overall barbecue experience: Louie Mueller. The great sausage, the second-best brisket, the outstanding beef rib, dip, atmosphere, and distance from Austin make this the winner. Still, we'd both be willing to drive 2 hours each way to Cooper's next time we're in Austin, so consider it a very close second. 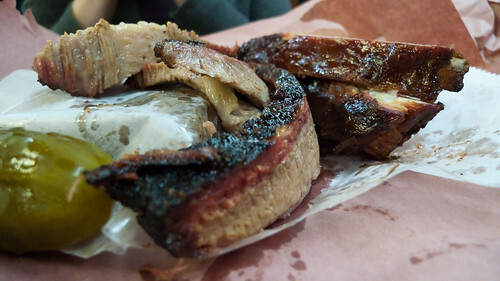 Best of lockhart/luling: City Market in Luling. Kreuz and Smitty's both put out tough ribs and brisket (we requested moist/fatty everywhere we went, and it was cut from the point end) and boring sausage. City Market wasn't the best brisket we had, but it was very good, and the sausage was also a notch above Kreuz and Smitty's. Oddly, Smitty's seemed to cut with the grain, so it was exceptionally difficult to chew. Overall, we were glad we were eating at all three for lunch and so had small portions at each, because none were exceptional. Luling City Market was very good, though. Cooper's: The sausage was of the kielbasa style, and pretty good. The ribs were truly forgettable. The brisket was amazing, even if it doesn't look it in this picture. Louie Mueller - Thoughts above. 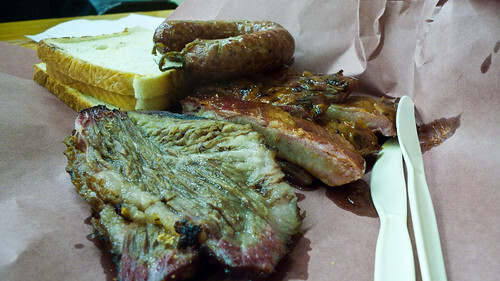 Great sausages, great brisket, awesome beef rib. Pork ribs were the best of this type of rib, but stick to the beef and sausage. 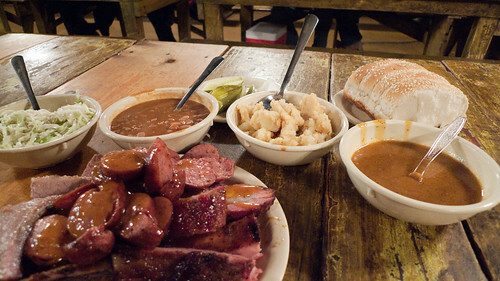 Salt Lick - Glad we went here on Valentines Day, as it wasn't too busy, wasn't doing anything special, and was open late. Brisket is dry and a little bland. Sausage is kielbasa style, and pretty good. The sauce is a bit weird. But the ribs are pretty good. 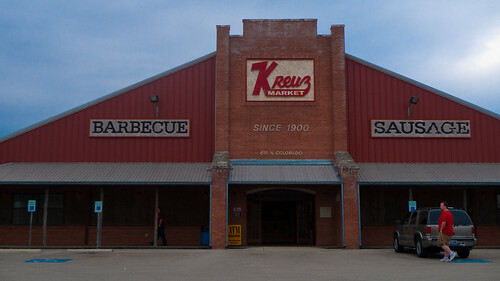 Kreuz Market - Mealy sausage, tough ribs and bland brisket. We were there for lunch on a Monday, so maybe things were slow, but it was unimpressive. 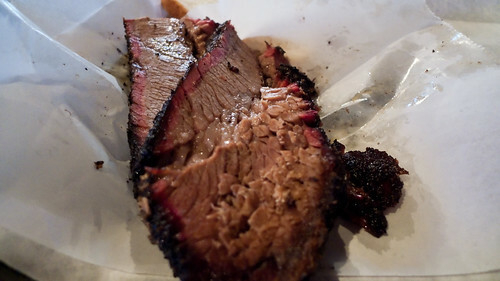 Smitty's: Despite being cut strangely, the brisket was actually better than Kreuz, moist and tasty. Sausage was similarly mealy, ribs were a tiny bit better but also forgettable. Luling City Market: You can see that this brisket is moister than the local competition. The sausage was also a little bit better, and the ribs were another notch up. Sam's: Ribs had nice bark, sausage had a very loose texture that wasn't that great, brisket was pretty good - tender and smoky. Unfortunately, they didn't hear my sauce-on-the-side request, and the sauce wasn't that great. Louie Mueller looks like the inspiration for Smoque's decor. I agree with your assessment of the Salt Lick -- not that impressive brisket compared to what I'd had elsewhere (you didn't hit Black's? ), but I did really like their sausage. 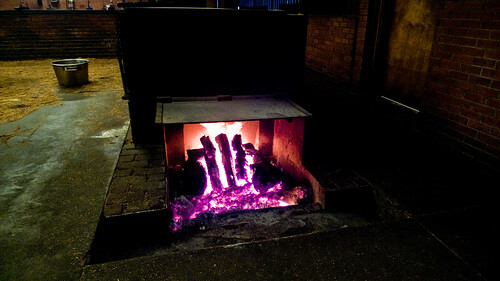 Smoque will look like Louie Mueller's when they've burned logs in the middle of the room for 50 years. Here's a solid dose of Mueller's atmosphere, along with the one thing you sadly won't see there now: the late Bobby Mueller at work. Central Market - Worth a stop. Great selection in every regard, including a really impression amount of Canadian candy/cookies and a long wall of sodas and bottled water. HEB may have started this chain to compete with Whole Foods, but it feels in every way superior to Whole Foods. I wish there was one here. Teo: Good gelato. The flavors on our first trip weren't that hot (a little underflavored, not quite rich enough), but the second batch was much better. I couldn't tell you the flavors, though. Short memory. Amy's: A cold stone knockoff (well, it's a knockoff of the ice cream store that preceded Cold Stone). But, much better ice cream than cold stone and at the Guadalupe location, an atmosphere that Cold Stone will never come near. Both Teo and Amy's are worth stops if you're in town. Habanero Cafe: OK flavors, but just nothing special. If this is among the best tex-mex/mex-mex in Austin, I'll stick to Chicago mexican. Enchanted Rock and the LBJ ranch are lots of fun, and both in one day is totally doable. Head out to the LBJ ranch in the morning, spend a couple hours there and then head over to Enchanted Rock. The hike up to the main summit and back shouldn't take you more than an hour and a half, and you can get plenty good views just going halfway up. From there, you're less than half an hour from Cooper's! We really liked Austin a lot, and we'd love to go back. Joel: We could only handle 3 places for one meal. Black's seemed to be the least highly regarded of the four, so we skipped it this time. 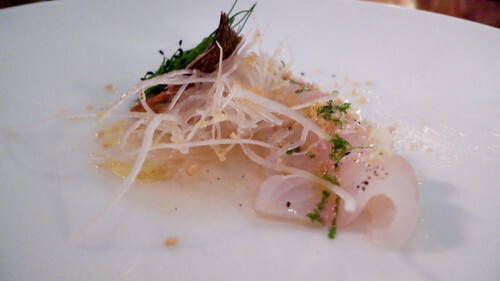 Ed, wow, great photos, particularly of your Uchi meal ! Thanks for sharing. While I didn't grow terribly attached in my 3-year stay, I've been longing for many things Austin since the day I left a couple of months ago. gleam wrote: Habanero Cafe: OK flavors, but just nothing special. If this is among the best tex-mex/mex-mex in Austin, I'll stick to Chicago mexican. As the only (at-the-time) Austinite in the thread, I'm a little embarrassed and sorry that the only recommendation of mine turned out to be a dud. I guess I'm just not a fan enough of the gloopy-queso-sauced Tex-Mex joints to recommend one, but I think Habanero has excellent mesquite-grilled beef fajita rancheras and their breakfast is also top-notch (I don't stray from this protocol, in fact). I don't think the best Tex-Mex in the world could ever compare to regional Mexican in Chicago, but Austin does have some excellent Tejano-style-Tex-Mex that typically comes from the carts in the grittier east-side of town - very simple and homey stuff, fresh corn tortillas lovingly rolled out in front of you, thick crispy-chewy masa-laden sopes, slow-cooked meats (guisadas, cabeza, barbacoa, etc), posoles with soul, etc. Nothing you've never heard of, but outstanding renditions of simple Tejano comfort classics. It's a whole genre of cooking with a subtlety that took me three years to appreciate. Anyways, I'm glad you enjoyed your trip ! You've got me thinking about a return trip back already. tatterdemalion, you weren't the only person reccing it and others were much stronger than yours. I think it's quite possible we misordered (breakfasty tacos for beth, carne guisado for me). I'll definitely be on the lookout for some of the other recommendations you made next time!